style, it hasn't lost its charm. to turn two corners - it could just go straight, two corners is the maximum. If the squares are adjacent (not diagonally) they can also be made to disappear. the first one, then the second. These two tiles will then disappear. The 8s can also go as they are adjacent to each other. Now the 9 has become free and we can match it with the nine on the top right. You are now beginning to get the idea. matched with each other stopping the clock for a short time. can be matched with any other flower from the four. The second set is seasons, and you can match any season with any other season. matching the first available pair you see! can try for high scores or even compete against each other. grid is 16 by 6, the total tiles must add up to 96.
on it, button b will subtract from it and button c will clear it to zero. 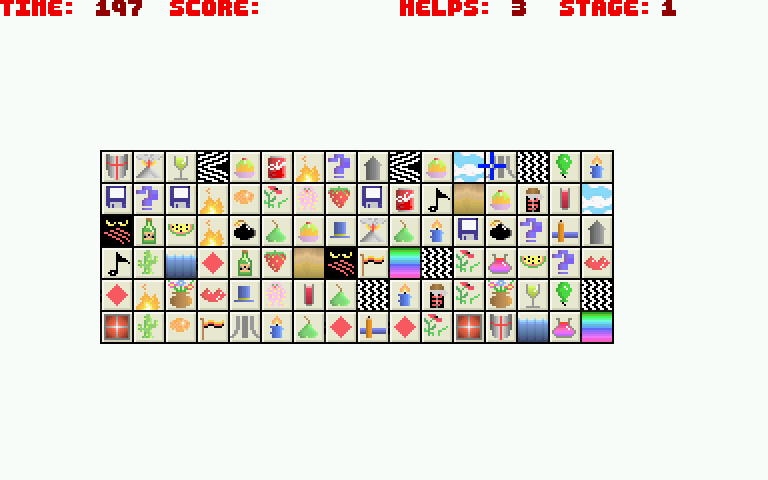 tile layouts, F1 being the hardest and F10 the easiest. Press space or click on exit to return to the main menu. These options are mainly of use for those of you indulging in two player games. complete the grid wins the round. Nailbiting stuff. Tile layout can also be configured here. 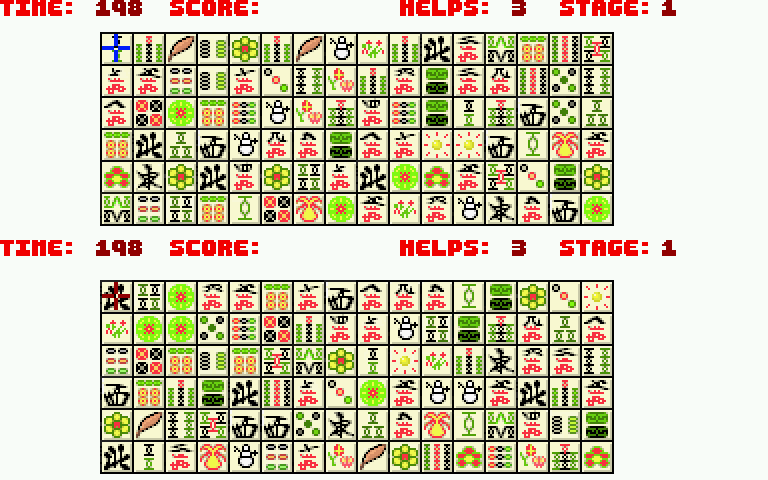 DIFFERENT - Player one and player two have different tile layouts. clock is largely an irrelevance, it is your opponent who dictates the pace. match. For example, the best of 3 would mean the first to achieve 2 wins. 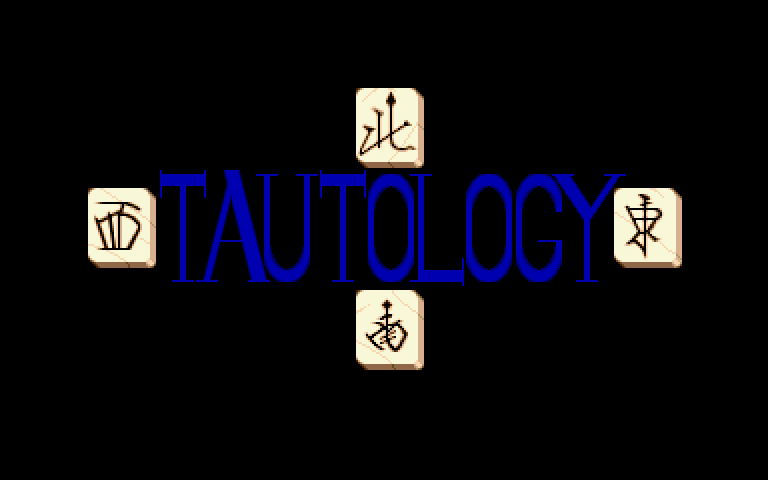 Tautology has two inbuilt tile sets in case you get bored (perish the thought!). 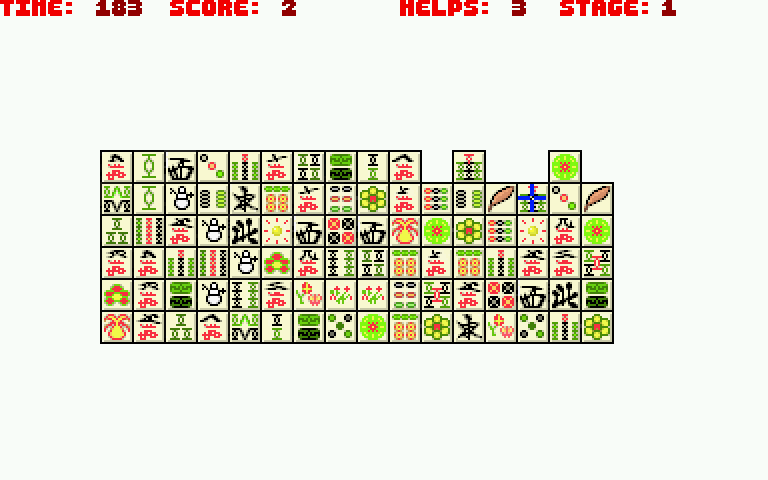 The Shanghai Set was painted by Mr. Blonde and is based on the mah-jong set. are fruit and elements. See rules for further details. Tautology will read this file and then ask you which set you want to load. Press the appropriate function key to load it. 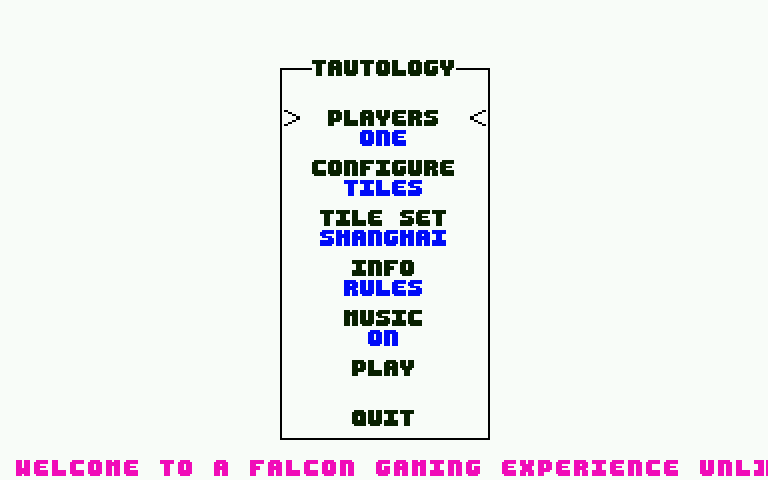 version of Tautology plus the latest versions of my other Falcon projects. 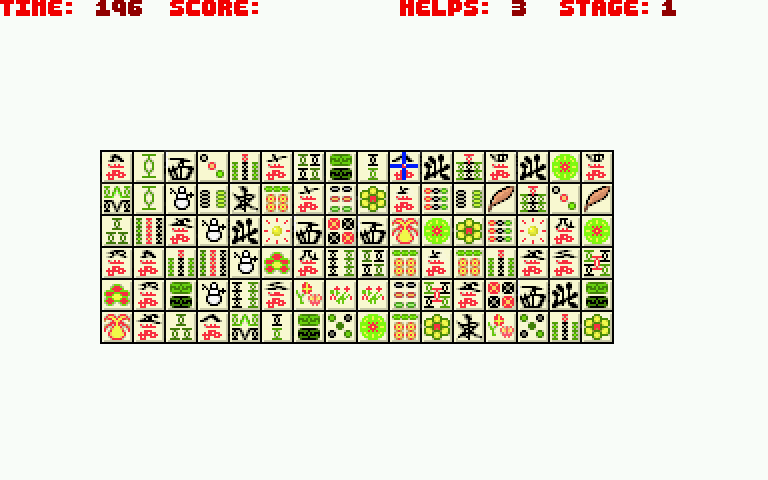 sets from the current series of tiles. The top twenty best scores are saved to disk! Make a name for yourself! 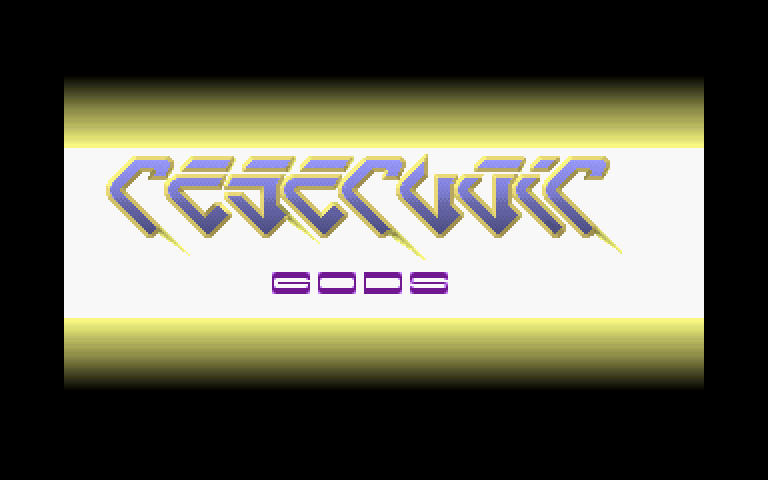 Not currently working on VGA screens but will soon (when I get one! ).